Much Ado About Nothing, Borges' Aleph, Herzl's Tel Aviv, What would Kany Say? The Talmud was hypertextual before we had the word. 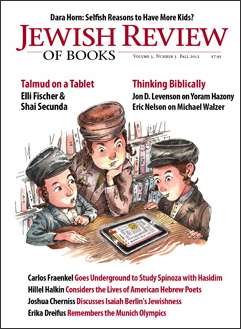 ArtScroll's new app is only the beginning. Economist Bryan Caplan thinks parents “overcharge” themselves when it comes to investing in their children. Glückel of Hameln knew better. What is lost when the books of the Hebrew Bible are read as philosophy? Organizers of the 1972 Olympic games were determined to avoid recalling Munich's Nazi past—which inadvertently facilitated the bloody massacre of Israeli athletes. Historian Bernard Wasserstein narrates Jewish life in Europe between the world wars. Beginning in 1940 the French and the Zionists had a common enemy—the British. A professor and three Hasidim walk into a bar—to study philosophy. True story. The Israeli music scene is bringing together world-class Israeli jazz and classic Sephardic liturgical music. Voilà! : the jazz piyyut. Peter Berkowitz responds to Jeremy Rabkin. Preserved for centuries by Syrian Christians, spoken-Aramaic is now breathing its last.